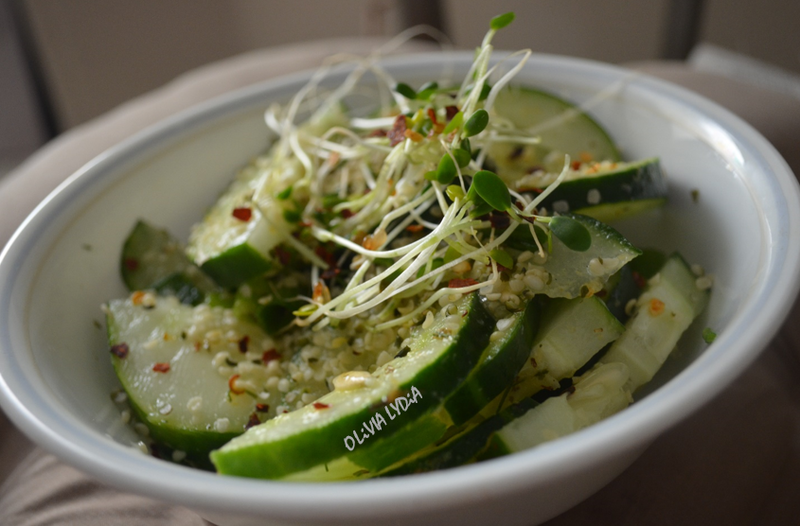 Cucumber Lime-Dill Salad – Olive For Greens. Salads are boring blah, blah, blah! They can be, yes. On the flip side, living a healthy lifestyle, that includes adding an abundance of greens to your diet, will require a bit of creativity. I love salad! I create my own salad dressings to keep mine interesting. The trick to a tasty salad/dressing adding unique ingredients, such as sprouts and herbs. Just like I did here! Try this when making your next salad meal! Starting with the dressing ingredients, combine in a small bowl and set aside. Add the salad ingredients to a personal-sized salad bowl. Pour desired amount of dressing over salad. This salad can be eaten as is or you can add it to a bed of greens. For the cheese eaters, add some crumbled feta.